fatBuzz: Should I or shouldn't I - Is fear stifling your creativity? Should I or shouldn't I - Is fear stifling your creativity? Many good ideas never see the light of day through fear of failure or ridicule. How many times have you had what you think is a good idea but, by the time you go to implement it, doubts have set in and fear takes over? You then shelve the idea with the intent of 'sleeping on it' and it never seems quite such a good idea again. This week's New Media Breakfast can perhaps help to dispel some of these fears or, confirm you shouldn't proceed. 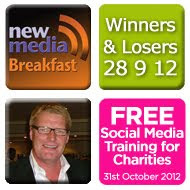 I will be looking at some examples of social media winners and losers; campaigns that have worked well and others that have ended in tears, hopefully you will get inspiration from some and cautionary intelligence from others. I have tried to choose a wide variety of cases from the world of industry, commerce and charity - there is no shortage of examples of winners and losers whatever the sector. I have also tried to pick examples from all of the main social media platforms so, regardless of which platforms you favour, hopefully there will be something you can relate to. • What kind of social media works - or doesn't! • What is success or failure? I hope as many people as possible make it along to find out about this important issue and I hope that all attendees will leave with the confidence to try new ideas. I hope in the future the only real barrier to your social media marketing success is the limitation of your own creativity and that its not coupled with fear of failure. You can read more about the New Media Breakfast here.